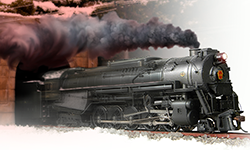 Paragon2: The new benchmark for premium HO locomotives is here. These DC and DCC-Sound equipped locomotives feature the ALL-NEW Paragon2 sound and control system. Each Paragon2 sound-equipped steam locomotive comes with BLI's own integral DCC Decoder factory installed. Each Paragon2 sound-equipped locomotive features superb back EMF motor control in DC and DCC, recordable DCC operation for Automated Playback, Synchronized Puffing Smoke, Radio Crew Chatter, Ambient Surround Sounds, & the same detail level as the original Paragon Series-- All in the familiar sturdy maroon box!